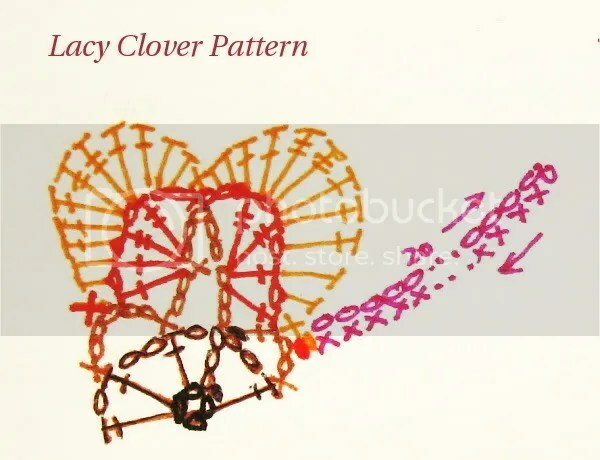 The pattern was drew by hands. I found two trivial/ignorable mistakes (at the beginning of the 4th and 5th round) in the pattern this morning. Hopefully the following description can help to sort it out. Please let me know if you find any mistakes, so I can improve the pattern. R2: ch 4, (dc in the loop, ch 2, dc in the loop, ch)x 4 times, sl st to the third ch at the beginning of this round. R6: ch 20, turn, sc in the second ch from the hook, sc 18, sl st to the beginning. Fasten off. This is really beautiful. Thanks for the pattern! I can’t wait to make one, thanks for sharing your pattern. (ch 5, sc 5 in the next dc, sc in the 5th ch from the hook…. Yeah, it was an error. I’ve corrected the part in the parentheses. It should work this time. Thanks for the great pattern! I just made it and posted it on ravelry (my name is Mbarkle). My daughter wants to make one, so I made one to test the pattern for her. The drawing was a big help. Thank you so much. This pattern is so beautiful! I’m just a little confused on rounds 4 and 5.. it says “ch, ” and I can’t really tell from the diagram how many to chain.. am I just missing something? 🙂 thanks! I have linked you in my website. which 2 ch area do you mean? R2: ch 4 (counts as first dc and ch), dc in the loop, ch 2, (dc in the loop, ch, dc in the loop, ch 2)x 3 times, sl st to the third ch at the beginning of this round. This is perfect! I have a curry stain on my favourite t-shirt, and I wanted something small but attractive to stitch on to “dress it up” and hide the stain all at the same time. of clever work and reporting! Keep up the wonderful works guys I’ve incorporated you guys to our blogroll. I want to make this! Sure is cute! At round 4 it says to dc in the 3 rd chain. Where is the 3 rd chain? I’m lost on finding the 3rd chain and I’m not sure where the starting point is on the diagram. Can someone please help as I love the finished product and want to make it. Need number of chains for rows 4 & 5. Also chain for in the rows . This makes no sense, do you have a revised pattern without any mistakes?? I would love to make these before St.Patricks day. In Round 5, I assumed you skip the last and then 1st ch on either side of the single crochet? I’m talking about where it says hdc 2, sc, hdc 2… Also, Where the pattern says, (dc, tr, dc, tr) the diagram shows (dc, tr, tr, dc) in the next ch. I used the diagram. I made this using chunky yarn and found that I needed to eliminate the ch at the beginning of the 4th and 5th rounds to make hold together more tightly. I really like how this turned out with the chunky yarn and hope to incorporate it into a chair cover, maybe with the Celtic not border pattern. Thank you so much for sharing this great pattern! In R2, should it read: ch 4, (dc in loop, ch 2, dc in loop, ch 2) 4 times, sl st to third ch at beginnng of round? I am referring to the end of parenthetical instruction where you have …in the loop, ch)…you don’t say how many ch, but I assume it is ch2. This lacy pattern is beautiful. Thank you so much. Hi I’m thinking of trying this. What size yarn and hook did you use? Thanks!